Like many artists, Monica Barnett has studied and worked in various mediums throughout her career, but sometimes it is important to get back to basics. In the quality of the drawings we find a blend of near scientific observation – in Barnett’s detailed examination of the musculature, with an idealized, almost romantic perspective – the animals are most often captured in motion, the mane extended. 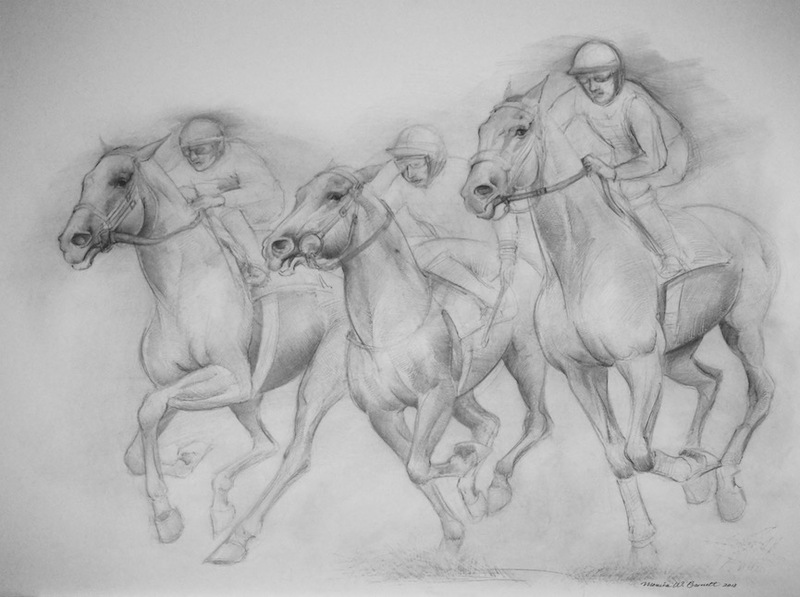 It is a point-of-view not unusual for an equine artist, especially one born and bred in Kentucky. Barnett does not restrict her choice of subjects to the thoroughbreds that are part of the identity of the Bluegrass State, her portfolio includes horses from France, Belgium, Wales, Austria, Saudi Arabia, Portugal, Norway, and the Netherlands. Barnett participated in the 2018 Spring Art Show at Mellwood Art and Entertainment Center in February, and the Stella de Luce Art and Wine Show in March.